Manchester City manager Pep Guardiola described old foe Jose Mourinho as a "good guy" ahead of this weekend's Manchester derby. United boss Mourinho has clashed with Guardiola numerous times over the years, with their previously intense rivalry dating back to when they coached Real Madrid and Barcelona respectively. Mourinho was widely assumed to have been annoyed by Barca's decision to appoint Guardiola over himself in 2008 and the pair had a number of fractious encounters during their time together in LaLiga. A Clasico clash provided the nadir when Mourinho poked a finger into the eye of Guardiola's assistant Tito Vilanova during a touchline fracas. But since they took charge at United and City the relationship between Mourinho and Guardiola appears more cordial, with the Catalan happy to avoid the rows of the past. "Thank you so much. 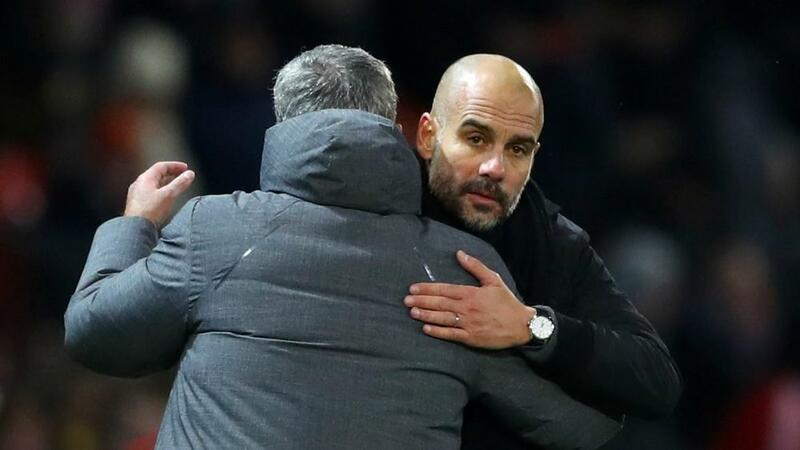 Thank you," Guardiola said when asked if he was pleased the pre-match focus was not placed on the perceived battle between himself and Mourinho. "At the end we are both good guys, more than you expect. It's much better, believe me." United cross Manchester on Sunday following successive comeback wins, a 2-1 triumph at Bournemouth followed by a stunning Champions League victory at Serie A giants Juventus by the same scoreline. Juan Mata's free-kick got United back on terms after Cristiano Ronaldo opened the scoring, with Leonardo Bonucci's own goal in the 89th minute then earning United a famous victory in Group H.
"No team wins in Turin in the last nine years, how strong Juventus are," Guardiola said of United's eye-catching result. "They had a problem for 10 minutes after Cristiano's goal but they were so stable with a lot of commitment, aggressive without the ball. A few weeks ago at Stamford Bridge [against Chelsea], one of the toughest places, they almost won. "It's always complicated. In our history of Manchester City it's hard to beat United and they beat us more times but it's a good rivalry and a good chance for three points. "We will try especially to have a good game. We'll speak with the players about what we guess will happen and suggest what we should do to win the game. "We have to play good, only one challenge in football is to play good, and have more chance to win. The top teams, you cannot imagine and think about it, play amazingly for 90 minutes and they don't have chances." United also came from behind to win at the Etihad Stadium in April, denying City the chance to clinch the Premier League title in the Manchester derby with a stunning 3-2 victory. "The first 75 minutes in the last game, I'd like to play the same, top for 75 minutes, but United showed us last season they need 10, 15, 20 minutes to create a lot of chances," Guardiola said. "The sensation when they have the ball with players in front, wow, they have incredible talent in front and the middle. You have to defend deep and well, defend crosses well because they are so strong and better than us at set-pieces. "Bring our game and control as much as possible, be clinical - that's the game we will try to do."